Circuit on request only for organized groups. 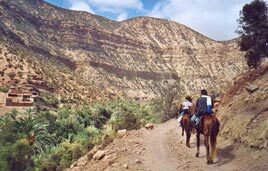 RIDING IN MOROCCO: Trail in the High Atlas mountains, which combines passages on the Atlantic coast south of Essaouira, and through the protected area of Toubkal, the highest mountain (4165 m) of the Atlas, south of Marrakesh. Duration: 15 days / 14 nights - horseback riding trail 13 days. Advanced level, good physical conditions required. One day of rest in the middle of the trail. Day 1: Welcome in Marrakesh or Essaouira and night in the hotel. Days 2 - 14: Horseback riding trail. Night in tents. Last night in the hotel. Day 15: Transfer to the airport and return flight from Essaouira or Marrakesh. Trail through the mountains! This route connects two of the most spectacular tourist attractions of Morocco - Marrakesh and Essaouira. Some of the villages we cross are over 3000 meters above the sea, which allows a splendid view over deep and steep valleys. 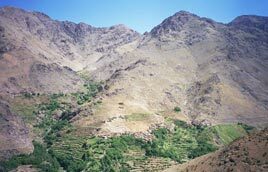 Many of the paths are only used by the Berber, the native mountain people and sometimes crossing them by feet is unavoidable. From ridge paths we are able to enjoy a magnificent view over the snowy peaks of the Toubkal mountain chain and each path offers us a new landscape. Particularly beautiful is the interplay of aridity and rich green valleys that creates amazing natural sceneries. Duration: 15 days including 13 days on the horseback and 1 day of rest.